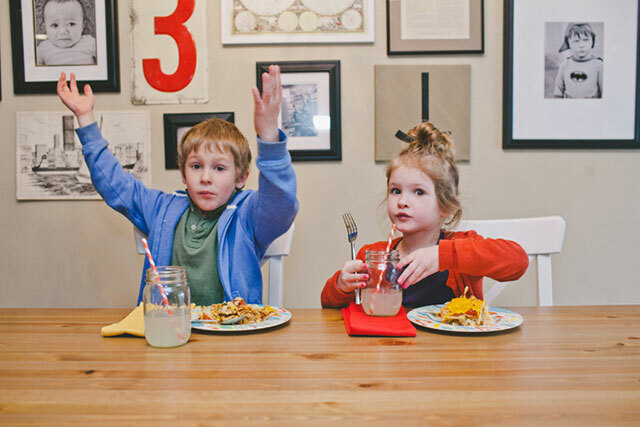 i wish i could say that having my brood makes me an expert at picky eaters… but not so much. every time i think i have it figured out, the next one is picky in a totally different way. for instance, my oldest, ozzie required dippy to eat during his toddler years. while my youngest, griffey is choosy about ev.er.y.thing…. child doesn’t even eat fruit right now unless it’s in smoothie form. same song for the middles, too. just a different tune. while I don’t have a foolproof plan to share there are a few tricks and yummy recipes i’ve learned and this mexican lasagna recipe is the perfect example of both. * if your little ones enjoy helping out in the kitchen, this recipe is the perfect fit for them (and you). lots of prepping and assembling to keep their hands busy and kids love to eat what they helped make. usually. * it’s colorful, which is a good distraction. * the greatest advice i’ve received is to have my kids try something multiple times before deciding to scratch it off my recipe list. this recipe makes a big enough batch that you’ll have plenty of leftovers to offer to little ones if they don’t like it right away. * lastly, it’s a total crowd pleaser…. hasn’t failed me yet and even gets rave reviews at yoder’s (my hubs) fire station! doesn’t it look good? in a messy sorta way? 1. Heat 1 tbsp of olive oil in a large sauté pan and cook the onions for 3 minutes. Add the garlic and sauté an additional minute. Add the ground turkey meat, cumin, salt and chili powder and cook for 6-7 minutes until cooked through. Place turkey mixture aside and cool. In a large bowl, whisk the egg and sour cream together. Add the cooled turkey mixture, carrots, corn and cilantro and mix to combine. Spread a 1 cup of salsa on the bottom of the crock pot. Layer 5 tortillas on top of the salsa, cutting them if necessary to fit the crock pot and covering the salsa completely. Place half the turkey mixture on top of the tortillas and top with 1 cups of salsa and 1/2 cup of cheese. Add another layer of 3 tortillas on top of the cheese. Pour the remaining turkey mixture on top of the tortillas and top with another 1/2 cup of cheese. Top the lasagna with another layer of tortillas, pour the remaining salsa on top and cover with 1 cup of cheese. Cook on low for 2 1/2 hours & then serve! we’d love to hear about your little eater(s) in the comments below…. or perhaps a tip you might have to share!